Cocktails, Food, Beer, Punch, Charity? 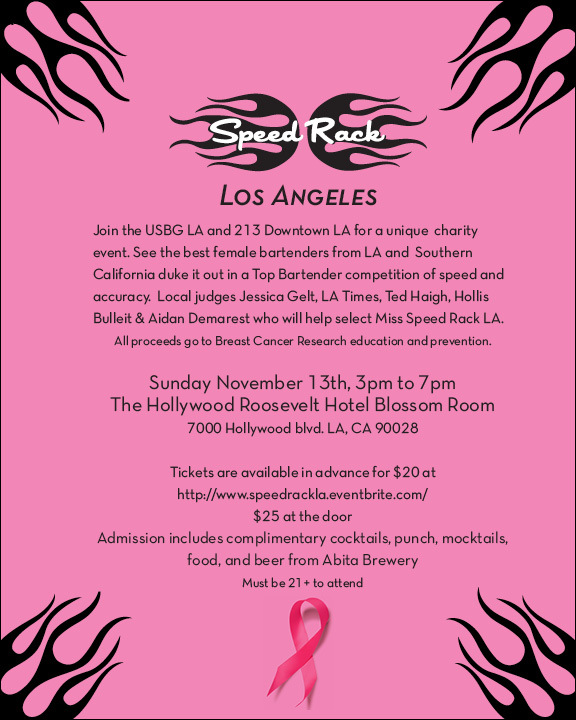 Check to all of those at Speed Rack Los Angeles, taking place this Sunday afternoon from 3 - 7 pm at the Blossom Room in the Hollywood Roosevelt Hotel. This benefit pits some of LA's best female bartenders against each other in a competition to see who can make cocktails accurately in the least amount of time. Dr. Cocktail himself, Mr. Ted Haigh, will be one of the four judges. Tickets are only $20 in advance ($25 at the door) and all proceeds go to fight Breast Cancer. Yes, thanks to the generosity of sponsors, 100% of the proceeds go to charity. Competitors include the Spare Room at the Roosevelt's own Naomi Schimek, as well as Danielle Crouch of Cana Rum Bar, Devon Tarby of The Varnish, Kiowa Bryan of the Eveleigh, and Mia Sarazen of Harvard & Stone among others; in total 18 women will compete. This promises to be quite a party. Ivy Mix and Lynette Marrero of LUPEC (Ladies United for the Preservation of Endangered Cocktails) in New York are the hosts and organizers of Speed Rack, which is stopping in cities coast to coast to raise funds for charity and showcase the talents of female bartenders. The Hollywood Roosevelt Hotel: 7000 Hollywood Boulevard, Hollywood.